The Braves receiver tallies more than 200 yards receiving and three touchdowns in quarterfinal win. Banks can breathe easy — finally. Marist Catholic recovered an onside kick, ran a kickoff back for a touchdown, and intercepted standout Banks quarterback Hayden Vandehey three times in Friday night's state quarterfinal, but ultimately the Braves prevailed 28-14, thanks to a sturdy defense and one heck of a night from receiver and defensive back, Blake Markham. "When (Blake) Markham gets the ball in his hands, good things happen," said Banks head coach Cole Linehan. "He doesn't come off the field. Offense, defense, special teams, he does it all for us, and every time the ball gets in his hands he can take it the distance." Markham had touchdown catches of 40, 53, and 80 yards, the last of which gave the Braves a two-score lead and iced what to that point had been an uncomfortably close game for top-ranked Banks and their Braves faithful at Kelly Field at Banks High School. "It was nice to do my part," said a humble Markham. "I especially give props to Bennett Turner for making that block that sprung me around the corner to get up the sideline on that last score." Don't be fooled however, nothing about this win was easy for Banks. Marist opened the game recovering an onside kick at the Braves'40 yard line. From there, the Spartans used 5:22 to move the distance in 10 plays, capping the drive with a Hayden Loboy 1-yard touchdown plunge to give visiting Marist a 7-0 lead. 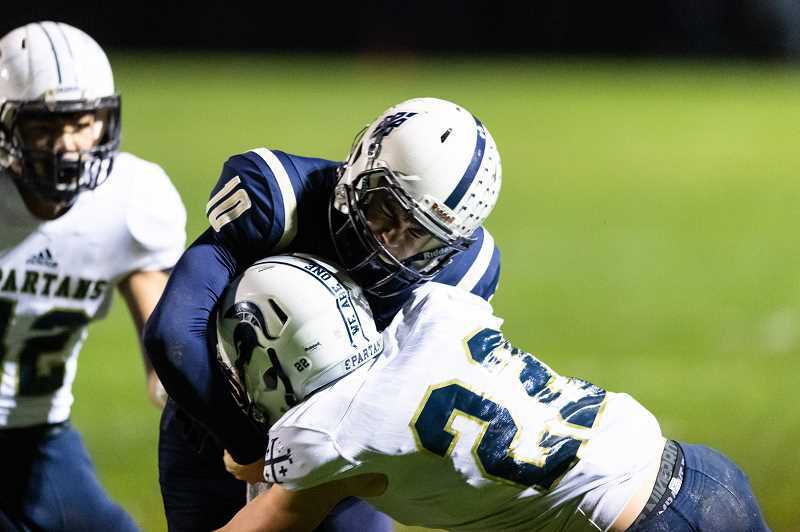 Banks answered on their next possession, putting together a methodical drive of their own, going 60 yards, also in 10 plays, capped by a Martial Stegemeir 1-yard run to tie the game 7-7 following a successful Jacob Slifka extra point. Things ground to a halt in the second quarter with a series of punts and turnovers, before Banks snatched the lead a minute before the half when Markham caught his first scoring pass of the night, a 40 yard bomb up the left sideline to put the Braves ahead 14-7 at the half. 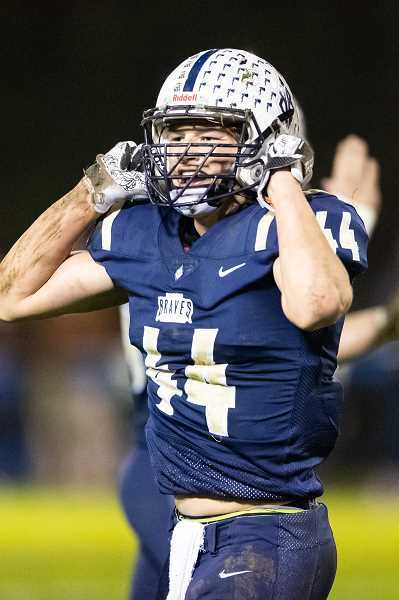 But just as things appeared to be settling into what most thought would be a relatively easy Banks victory, Marist's Garrett Phelps took the opening kickoff of the second half 85 yards to the house, tying the game and again applying pressure to the heavily favored Braves. "We talked about how sometimes things don't go your way in the playoffs," Linehan said. "You're not just going to blow teams out all the time. It comes down to who's going to make a play and who's going to step-up." After Banks' ensuing possession resulted in a missed 30 yard field goal and Marist was forced to punt, Markham caught a quick pass from Vandehey, made one man miss then pranced 53 yards up the sideline to put the Braves ahead 21-14. Then, with seemingly more to prove, the senior intercepted Marist's Max Campbell, setting up what again appeared to be Banks' opportunity to take control of the game, but Vandehey was intercepted two plays later and Marist was just a drive away from tying the score. It wasn't to be. 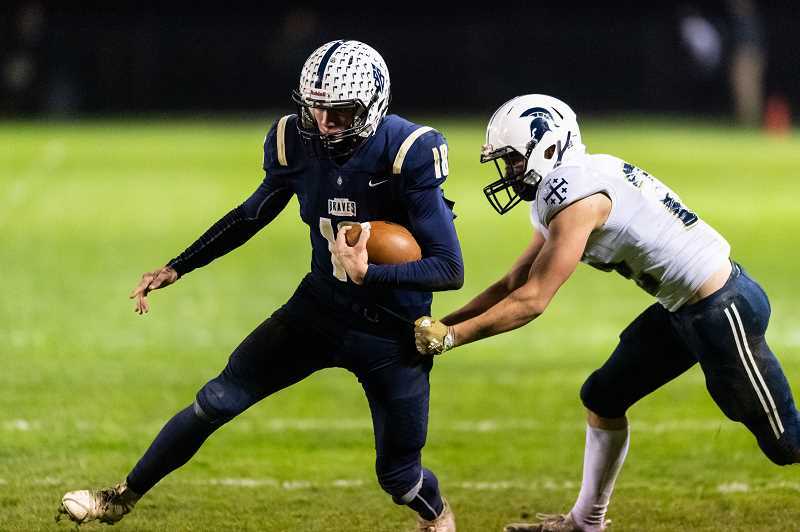 The Spartans were forced to punt following a sack by the Braves' Slifka, then watched as Markham put an exclamation point on his great night and Banks' quarterfinal win with an 80 yard catch and run to put the Braves ahead 28-14. The hard-fought win was a bit of a surprise to outsiders due to Banks' 51-13 win over the Sparts earlier this season, but not to Linehan who knew what a proud program like Marist was capable of. "Things just change in the playoffs," said the coach. "I didn't expect to come here and rout these guys. They have guys that can make plays and Frank (Geske) has been coaching for a long time, so I knew he'd have his guys ready to play." Markham — who finished with roughly 225 yards receiving — admitted that he and his teammates may have come in a bit overconfident due to their win over Marist earlier in the year, but vowed to not allow such to happen again. "The first game may have given us a little too much confidence, and we came out pretty slow and a lot of the things on offense weren't clicking," Markham said. "I think it was just one of those bad games, and we need to learn from it and not let it happen again." The senior receiver — like his teammates — was excited at the prospects of making it to the semifinals and was anxious to see who they'll play next week, but Linehan, while also excited, reiterated his season-long sentiment regarding any potential opponent going forward. "Our mindset is just to win," he said. "To prepare our tails off and get ready for whoever we get." Banks will play Marshfield, who defeated Mazama 28-23 in their quarterfinal game, in the semifinals, Nov. 16, at 5:30 P.M. at Cottage Grove High School.